Whether you’re a cultivator, manufacturer, or distributor, the first requirement for operating your cannabis business legally is obtaining a license, and states are quickly cracking down on businesses operating without one. California’s Bureau of Cannabis Control, the lead agency in developing regulations for both medical and recreational marijuana, began issuing temporary licenses to businesses at the beginning of 2018, allowing them to begin their commercial cannabis activity while their annual license applications are still being processed. Application Fees. The application fee for an annual retail cannabis license is $1,000 in California. Licensing Fees. Licensing fees in California range from $4,000 to $72,000 depending on the size of the operation. Cultivators, manufacturers, and distributors each require different licenses, so if a business is involved with more than one of these operations, multiple licenses must be obtained for a business to function legally. California allows for vertically-integrated businesses with three or more commercial cannabis activities. Residency Requirements. While there are no residency requirements for state licenses, counties and cities may impose residency requirements at the local level. Taxation. Taxation in California is significant – a 15% excise tax on the average market price of the retail and a sales tax based on gross receipts, a cultivation tax of $9.25/dry-weight ounce for marijuana flowers, and a cultivation tax of $2.75/dry-weight ounce for marijuana leaves. Some local governments have also enacted a cannabis business tax. Application fees, licensing fees, and taxation aren’t the only financial burdens weighing on these businesses – fines can cost up to four times as much as the license itself. In California, each compliance discrepancy can result in a fine up to $5,000. Being found out of compliance, even for small infractions (i.e. missing business documentation) can result in heavy fines or revoked licensure. Pre-licensure expenses are already heavy, so operators need to be technologically-enabled throughout the entire supply chain in order to seamlessly adhere to regulatory requirements and avoid costs. On-site regulatory compliance requires inventory tracking and reporting from seed to sale, and each stakeholder’s business affects the next – both downstream and upstream. A cultivator needs a reliable, compliant manufacturer, and the manufacturer needs a reliable, compliant distribution channel. At the other end, a dispensary needs products that come from reliable, compliant distributors. Seed to sale reporting is required at each touchpoint so that the state can monitor and trace every plant along its entire life cycle. 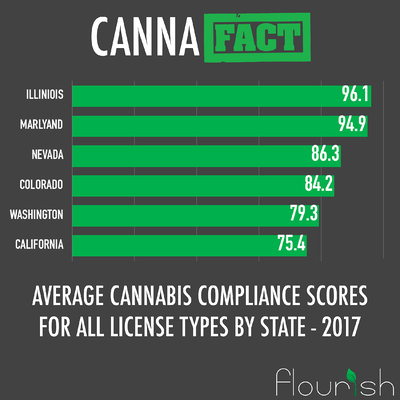 Currently, California has the lowest cannabis compliance score against other states at 75%. In order for businesses to remain viable, avoid disruptions, stay competitive in a stringent regulatory system, and set themselves up for long-term success, they need to monitor compliance. Next week, we’ll dig into what day-to-day compliance looks like for the cultivator, the distributer, and the manufacturer. 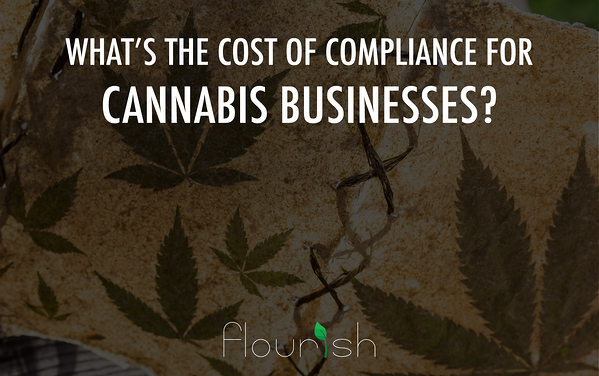 Learn more about how Flourish tackles compliance seed to sale.